This is one of my Mother’s paintings. 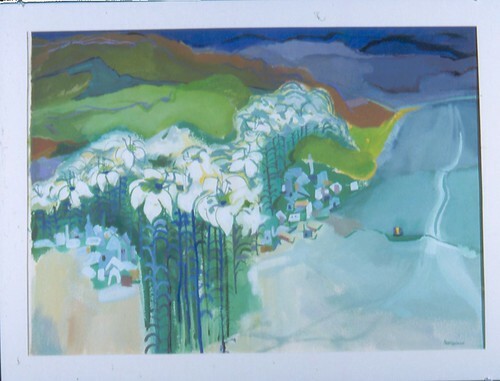 Its called “Lilly White Town.” She painted it to symbolize the new world we had moved to when we left Kansas and my Dad began teaching business law at Mankato State. It was a different world where some of my new school mates took to calling me “reb” because they thought my Kansas accent was a southern accent. 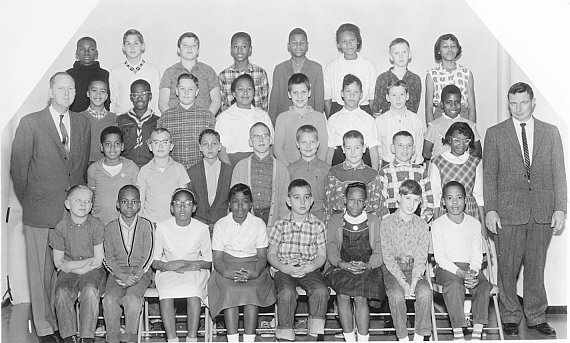 When I moved from Topeka, Kansas, to Mankato, Minnesota in 1963 to start junior high school I left a classroom in which there were as many black kids as white kids. My new school had never seen a single black child in a hundred years. The fellow I call “my Buddy” likes to send me emails calling be a “bigot.” He also calls me a “race hustler.” This is a person I once teased when I discovered he wrote a civil rights rule for a municipality back in the day. I don’t think that when he calls me names he means that I am prejudiced against white people although its likely he thinks I’m guilty of “liberal guilt.” This is a term used by “conservatives” who also like to call liberals “bleeding hearts.” Liberals are supposed to be driven by guilt to rectify old wrongs by accepting the blame for them. This is what Jesus did when he “died for our sins.” How dare libs take on a Jesus complex. Well, of course, this self righteous attitude would rankle. The equally dim “conservative” reaction goes something like this: “Don’t blame me and don’t expect me to apologize. I never owned slaves. The Civil War is over. Move on. And for your information – just because I’m white doesn’t mean I got any privileges handed to me.” I suspect, but can not prove, that all this goes through my Buddy’s head when he calls me names. After the Herculean multi-year task of putting 40 years accumulated paperwork in some sort of order in my attic office I’m sitting with a floor completely free from boxes, folders and piles of documents. There are just a handful of items within reach of my clean desk. 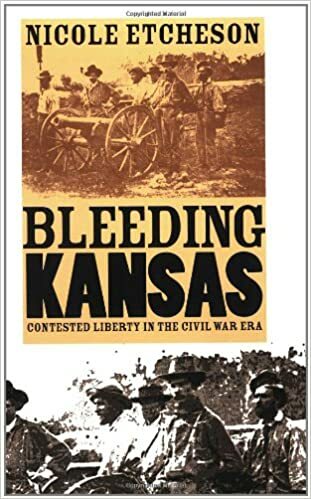 One of them is the book, Bleeding Kansas, I ordered recently after spotting it in the Kansas City Library. Its one of the books I plan to consult as I write about my Grandfather, George Robb, next year. His father settled next to a black former slave eighteen years after the passage of the Kansas Nebraska Act. Long time readers of this blog may remember my past references to my Grandfather’s ties with his neighbor the ex slave and my Grandfather’s service with black soldiers in World War 1 and maybe even the black maid my Mother hired to take care of him when he became infirm. I think I’m the perfect person to talk about race. I think my Mother suffered from a little guilt where race was concerned. The painting at the beginning is evidence of this. The schools she attended were segregated until she got to junior high school. The Civil Right’s movement was going full bore when she was a young mother. Then she moved to Mankato at its height where there was precisely one black resident among 40,000 locals. He was Dr. Boerboom a veterinarian. I, on the other-hand got the benefit of Brown v. Topeka Board of Education, another frequent topic in this blog. These were my classmates in sixth grade before I left Topeka for lily white Mankato. In many ways attending school with so many black kids inocculated me from thinking of them as a sterotype. They were individuals and I can understand how and why the 8% of blacks who voted for Donald Trump might have justified voting for man I consider an amoral, race-baiter. Standing next to me at the top left is the only other Harry I knew growing up, Harry O’Neil. I vividly remember watching him round third base on our elementary playground after he lofted a kickball way into the outfield and looking over his shoulder to make sure he could run to home plate. A split second after he turned his head forward to run into home he smacked into an immovable six-inch-wide tether-ball poll that the Topeka Schools had inconveniently placed on the path from third base to home. He lost his incisors. On the other end of the top row is Cynthia Robinson. What an annoying girl. She insisted she had another last name that belonged to her real father. There was a divorce or something going on. She was a tattle tale and a religious scold. She once tried to get my favorite teacher Mrs. Criss to kick me off a science club for some infraction. When she overheard me say something she disapproved of she grandly told me that if I ever took the Lord’s name in vain he’d strike me dead on the spot. I took great delight in looking up to the heavens and shouting to God to kill me. Poor Cynthia could only tell me reproachfully that God would oblige me but do it in his own good time when I least expected it. To my delight God has been in no hurry to expedite her prediction. There’s Sherman a couple rows below me. I remember Mark Knickerbocker telling everyone with great enthusiasm, when Sherman showed up in sixth grade, what a cool kid he was because Mark had known him at a different school years before. My first interaction with Sherman was after school when he snatched my folder of artwork and proceeded to dump the pictures I’d made out to blow around on the playground. I remember Vicky Bryant who is not in this picture because she was sent to Mrs. Muxlow’s sixth grade class where all the smart kids ended up. (Mr. Ross taught the losers although at the time I thought it was simply the luck of the draw that had separated me from so many of my friends) I invited Vicky to the cool Halloween Party my Dad organized for me in our basement. She was outgoing, smart, friendly and one heck of an athlete. I passed some of these black kids houses on my way to school next to “Tennessee Town.” Some of them had 12 siblings and lived in tiny rattle trap houses propped up on cement blocks. Leslie Lewis was one of them. She was an Amazon who my Mother thought was becoming quite mature while I only saw her as a goofy giantess. I remember quiet studious black girls from middle class families who were too dignified for me to get to know. Thinking back on it I suspect there was a powerful incentive for them to protect their dignity by having as little to do with dangerous white people than they absolutely had to. The five years I spent at Loman Hill Elementary School were like an inoculation against white cluelessness. It didn’t make me a champion for civil rights (which I think I am) but it gave me the sense that no one should be stereotyped based on the color of their skin. Heck, only a handful of my black classmates were really dark. A lot of them were much lighter skinned and represented a lot of white genetics. Gotta love the one drop rule. Among my many finds in the Kansas State Historical Museum Archives was a paper my Grandfather wrote about James H Lane. I have yet to read it and fully expect to learn more about Kansas History as I write a book about my Grandfather. I think America is in the midst of a new Come to Jesus movement where race is concerned. I think that sharing what I know of my Grandfather’s experiences could give us a new perspective and help us move on. If nothing else writing it will help me sleep better at night.